Day Trading Goals | 10 Reasons Why All Super Traders Use Goals. FOR THE SUPER DAY TRADER. Day Trading Goals -10 Good Reasons. Downloadable FREE PDF Version. Pt 1: – Why Do Super Trader’s Use Goals? – Top 10 Reasons. This; is the 1st part of my ‘3 part mini series’ dealing with the subject of goals, goal concepts & the art of goal setting for the Super Day Trader. I like bullet point lists; they seem to be far superior for memory recall than huge paragraphs of text of ‘Shakespearian’ proportions. So…… Here’s Pt1 as to why a goal approach & integrated methodology is so important within the realm of Day Trading. Original Goal: (Eventually), We Can Release it. Past Goal: Is To Reflect; Re-Evaluate; Re-Live It. Present Goal: We Re-focus; Re-Frame; Re-Align It. Future Goal: We Will Re-New; Re-Size; Re-Define It. 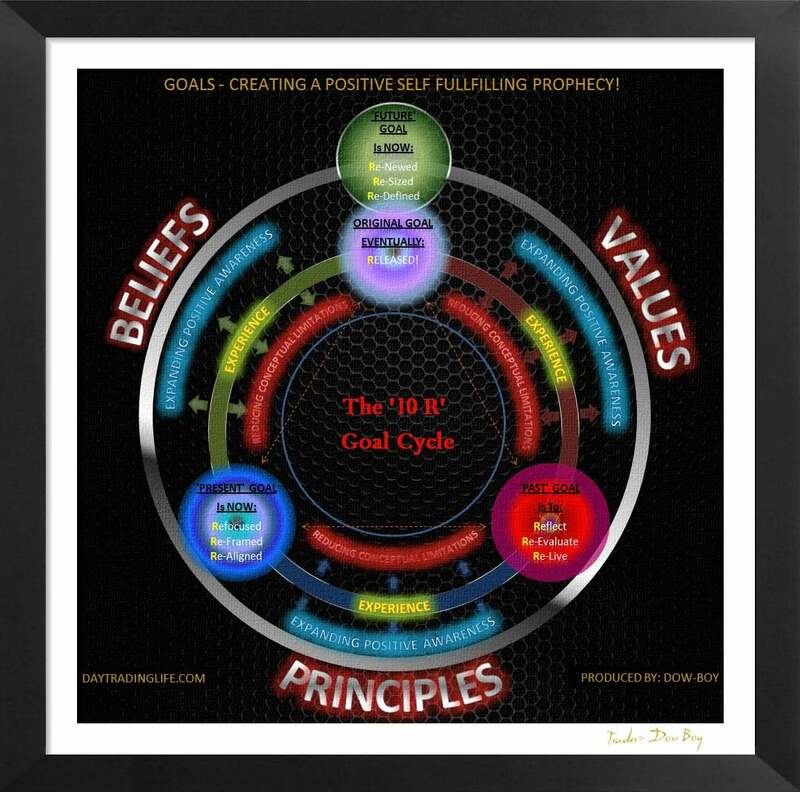 INTENTION: We live in reality, yet it is a filtered ‘PERCEIVED REALITY.’ Goals for the Super Trader are used as a lens, shifting one’s ‘Frame Of Reference’ (His Thinking & Awareness) to envision new opportunities, guiding ones’ decisions within a structured ‘INTENTIONAL’ framework via conscious choice. ANSWER: Neither! We are all products of choice! DESIRE: Goals instigate a strategy to achieve a desired result. ‘Goals Come With Desire.’ With desire come goals. The greater your ‘Goal’s Desire,’ the easier it will be to change your old conditioning. Alter your old conditioning & you change your old habits. CHANGE YOUR HABITS, CHANGE YOUR RESULTS! Desire is VERY Important. FOCUS: Goals are closely linked to ‘FOCUS.’ What is the most important part in a Super Trader’s Structure, his structure of excellence? ‘THE PROCESS!’ Goals help you to direction your focus (WITH CLARITY) on BEING! Being What? BEING THE PROCESS OF TRADING! YOU NEED FEEDBACK IN ORDER TO IMPROVE; SO… YOU NEED GOALS! HABITS FORMING: Goals are part of a ST’s consciously chosen system that helps ‘Reshape’ old negative self-limiting beliefs & habits that could be buried deep within his subconscious. Thus goals aid in the creation & formation of new habits. WHEN THE BODY BECOMES THE MIND! CHANGE: Goals help you change. It is said (via quantum law) that the environment is an extension of the mind. So importantly; if the World is shaped by our thoughts (potentiality), then ‘INTENTIONALLY’ shaping our destiny via goals & goal setting we will ultimately reshape our conditions & our environment, thus changing the events, circumstances & outcomes. NEVER UNDERESTIMATE THE TRUE POWER OF GOALS MY FRIENDS!